Found in the lush Central Pacific area of Costa Rica, the town of Dominical was originally a fishing village on the banks of the Baru River. Over the years it has morphed into a fun surfing and yoga haunt that has managed to maintain it’s charm and has avoided the over development that has happened elsewhere. 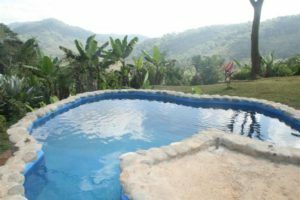 The proximity to San Isidro General allows for supplies to be readily available and prices are more reasonable than more remote coastal areas. 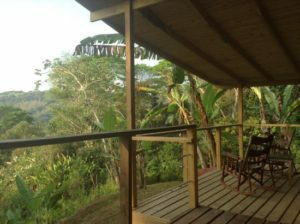 In the hills above Dominical a short drive up from the beach, at over 600 feet in elevation, enjoy cooler temps, amazing wildlife and breathtaking views of the valley and ocean below. A perfect place to enjoy nature is Edge of the World where rental cabins are perched above 180 acres of private jungle, including several seasonal waterfalls, a lagoon, a wide variety of fruit trees, walking trails, birding and more — right on the property! 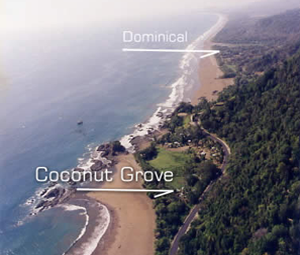 Just outside of Dominical is the quaint town of Dominicalito. The best place to stay here is Coconut Grove Oceanfront Cottages . Coconut Grove is run by Diane and Richard. They have a wealth of knowledge about the area and will make sure all your needs are met. Not only do they offer affordable, fully equipped cottages, but they have yoga classes and other health oriented meetings on a regular basis. 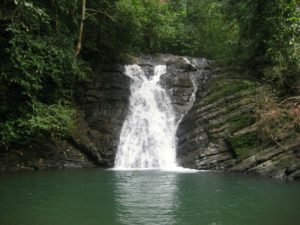 Horseback tours can be arranged to Nauyaca Waterfalls or you can take a short walk to Poza Azul. 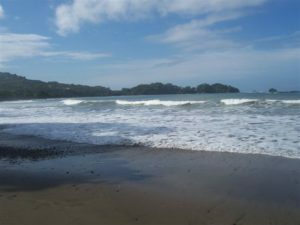 Marino Ballena National Park, which is home to turtles and whales on a seasonal basis is the other big place close by that is worth visiting. From Dominical to Uvita the beaches are less crowded and unspoiled. Although recently the Uvita area has experienced an upsurge in high-end developments. The area is still lush and green with Coconut and Almond trees and uncrowded. 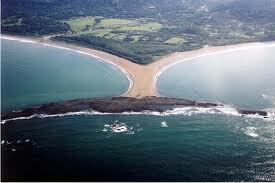 Playa Uvita has a white sand beach, perfect for swimming. Known for stunning mountain landscapes that stretch down to palm-fringed beaches, Uvita is centrally located on the southern Pacific coast of Costa Rica more specifically known as Costa Ballena. It’s home to breathtaking waterfalls, warm uncrowded beaches, a pristine marine reserve, and an unparalleled richness of beautiful plant and animal species. A unique place to stay is Manoas . Steve and Tatum are your hosts and are sure to make your stay perfect. At Manoas you’re close to everything you’ve imagined a tropical vacation could be. 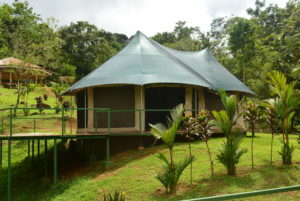 They offer luxury camping overlooking the Ballena river as well as fully equipped villas for families and groups of friends. Steve and Tatum are happy to recommend and arrange the best in local activities including birdwatching, Snorkeling, Surf lessons, Guided hikes in Corcovado National park, Sea Kayaking, Fishing, and a myriad of other fun things to do.